Posted June 22nd, 2015 by Jessica Garcia & filed under Uncategorized. When you think of Cancun and the Riviera Maya in the Mexico Caribbean, plan to visit the charming town of Puerto Morelos. It’s sure to be a delightful day! This quaint, artistic, diverse little town, is still a thriving fishing village and has claimed some of the friendliest residents from across the world as its own. Puerto Morelos is only a 20-minute drive south of Cancun and is a quiet retreat from the faster pace and excitement of the Cancun Hotel Zone or Cancun Centro (downtown). Its small-town charm and multicultural influence attract more visitors every year, especially those who prefer a more laid-back, relaxing vacation. Although small, Puerto Morelos is still a vacation spot with plenty of travel amenities to make you comfortable. 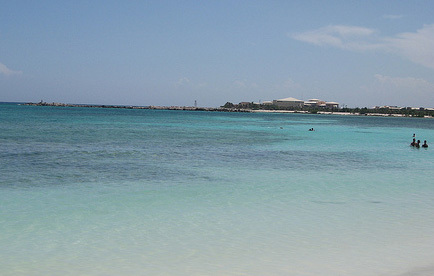 The Caribbean beaches in this small town are somewhat unrefined and retain much of their natural character. Although slightly more rustic than the tourist beaches in Cancun and Playa del Carmen, they’re untainted by cafes, bars, and souvenir shops. You’ll find beaches on both the north and south side of the zocalo (town square), but one of the nicest and cleanest beaches – except for some eel grass on the sand – is near the town square by the ocean front restaurant, Los Pelicanos. The Caribbean Sea at Puerto Morelos is a great place to go snorkeling, scuba diving, and fishing, since it’s near the great Mesoamerican Barrier Reef, formerly called the Palancar Reef, which is a protected National Marine park. The coral reef is flourishing with colorful fish, marine life, and coral formations, and lies about 200 yards off shore from Puerto Morelos so you could even swim there. If you need snorkel or scuba gear, a few snorkel and dive shops are near the town square. Boat tours for snorkeling, scuba diving, and fishing are available at the pier. If you want a real treat, try snorkeling and scuba diving in one of the nearby cenotes (cave-like sinkholes with natural wells fed by underground rivers) in their crystal-clear blue water. Along the Cenotes Route or Ruta de Cenotes, across the highway from Puerto Morelos towards Central Vallarta, you’ll find many cenotes. Some of the best ones to see are Boca del Puma, a distinctive cenote with jungle trails and a cave passage to snorkel through; Siete Bocas, an amazing cenote with rock formations that date back millions of years; Las Mojarras cenote, and Verde Lucero cenote, each slightly different with their own unique character. You’ll also find many things to do near Cancun and Puerto Morelos, including horseback riding tours, horseback riding on the beach, and eco tours of protected natural areas. Ecotourism and sustainable tourism are thriving in this part of Mexico with many eco parks, such as Tres Rios Nature Park and Sian Ka’an nature reserve in the Riviera Maya, south of Cancun. Boca del Puma is also an ecological reserve in Puerto Morelos that protects native, tropical jungle plants and animals. There is no shortage of places to eat in this small town. You’ll be pleasantly surprised by the variety of restaurants in Puerto Morelos, from international cuisine like Argentinian, Asian, Caribbean, Uruguayan, and of course, traditional Mexican food and seafood to coffee shops with deserts and family restaurants with pizza, burgers, and appetizers. If you prefer to cook your own food and you have a kitchen in your hotel room, the local fishermen will sell you their fresh fish and seafood at the corner market in the zocalo (town square). Now that’s a treat!